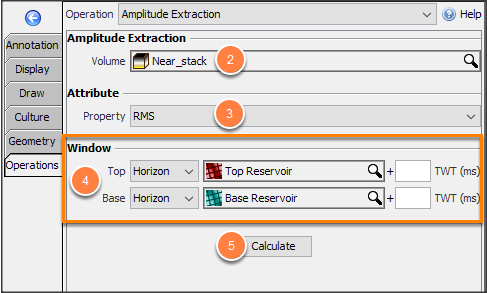 Use the Amplitude Extraction operation to extract values from a volume between two horizons. 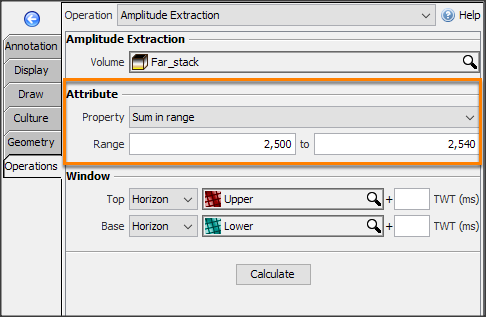 To extract values at a single horizon, see Horizon Display and Amplitude Extraction. Where is the amplitude extraction operation? Note: The Calculate button is disabled if the top or base horizons are waiting for another operation (such as propagation). Insight notifies you to complete the previous operation before continuing. Horizon amplitude extraction is found in the Map View, under the Operations tab (along with other horizon operations). At Operation, select Amplitude Extraction. Tip: Click the Help icon to read more information about this operation. At Volume, select the volume to extract values from. When choosing gather volumes, also select the gather value to use. At Property, select the value to extract, e.g. Simple Average, RMS, etc. (see Using Horizon Properties). At Top and Bottom, select the upper and lower boundaries for the extraction. Choose Horizon to use existing interpretation. Optionally enter an offset or shift to apply to the horizon. Click Calculate to run the operation. 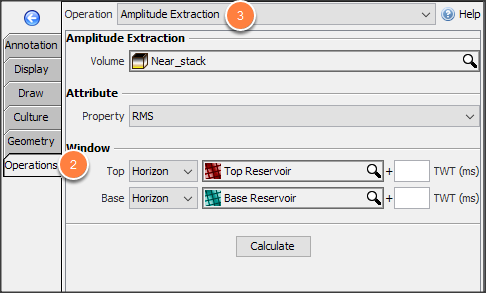 Tip: Horizon amplitude extraction can extract values from a group of volumes (see Creating a Group). When using non-gather horizons with a group of gathers, a gather value is required. When using non-gather horizons with a group of gathers and non-gathers, only the non-gather volumes will be used for extraction. Properties with ranges require a minimum and maximum value. Only amplitudes between the min and max values are included in the calculation. When calculating the result, samples are included if the horizon crosses the midpoint between one sample and the next. Horizons are interpolated to find the exact intersection, but the sample count is based wholly on the samples of the input volume. This example shows two samples from a trace with 20 ms sampling. The paired lines on the right indicate where two horizons intersect the samples and the number of samples that would be counted. This example also assumes all values fall within the min/max range for inclusion. Use amplitude ranges from the class. Update the range in the display class. Set specific a min and max value for this result. 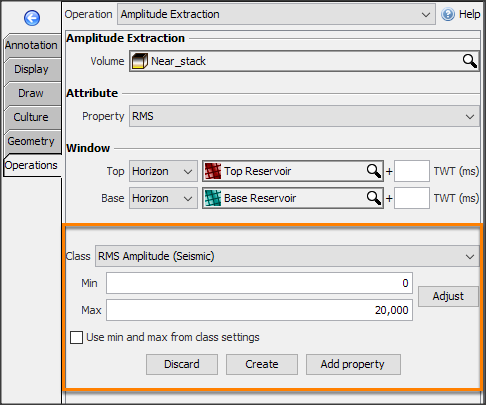 Click Adjust to set the Min and Max from the extracted amplitude. Click Discard to cancel this calculation and delete the results. Click Create to create a new horizon containing the extracted values. Click Add property to store the result as a horizon property. Note: By default, the new horizon will be named: “Attribute (volume): horizon window”. For example, the operation above will yield a new horizon called "RMS (Near_stack): Top Reservoir to Base Reservoir". To rename the horizon, see Horizon Details and Configuration.